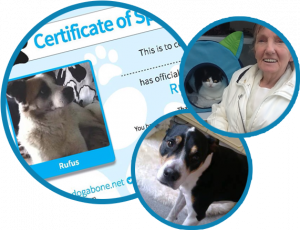 This charity has been set up to support the over 60’s to afford a rescue pet companion. If finance is a genuine concern, we can pay the rehoming fee and also support, each month, with the cost of pet food. Every time we commit to supporting with the cost of pet food, we commit to thousands of pounds over the lifetime of that animal. We have found homes for animals in the most desperate of times – terminal illness or death. We have found dog walkers for the elderly, emergency foster homes for animals whose owners have been taken into hospital and new homes for animals whose owners weren’t allowed to take them into sheltered accommodation with them. This sponsorship page is to help us off-set our monthly pet food costs for the over 60’s who need a helping hand. We are a young charity but, at just over 4 years old, we have helped almost 300 animals to find a brighter future. For full details, please visit our dedicated Sponsorship page.